I am a big fan of electronics and when it comes to tinkering, I get excited. While cleaning up my basement, I came across my old laptop hard drive laying around and collecting dust, after I sold the laptop on Ebay 4 years ago. In fact, while back I have been meaning to make some use of it for maybe backing my current desktop, although it still has my old files. However, I never got around to converting this internal laptop hard drive to an external drive, until now. Initially I felt that it would be cheaper to get an adapter for my IDE cable to hook up my laptop hard drive to my desktop computer to use it as it was indicated by many websites. So, I bought an IDE cable adapter for my laptop hard drive from Amazon. It was definitely cheap that I paid about $8.00 including shipping. I hooked it up to my laptop hard drive and to my desktop IDE cable. I thought I was ready to backup my desktop files, but it wasn't the case. My windows XP home edition had hard time recognising the laptop hard drive. In fact, at first I didn't see the laptop hard drive mounted for access. I thought, I should wait a little to see if my Windows XP will eventually see it and it did, but it took over 5 minutes. Then, I saw (Local Hard drive F:). At that, point I clicked on the drive expecting it to open with my old laptop files. It popped up with the messagebox requesting me to format the drive first. That wasn't what I expected. Although I wasn't too worried about the old files in the laptop, I still wanted to know if I had anything important I should keep from it. so, I thought I should do more research, because I knew there is got to be much easier solution and I should still be able to retrieve my old files from the drive. That's when I came across a product called External enclosure with a USB 2.0 adapter. After doing some searching online, I find it very affordable and reliable solution to turning your laptop hard drive into external storage media. I bought it from Newegg and it's actual name is "Link Depot ENWB-25B-SS Aluminum 2.5" USB 2.0 External Enclosure." When you order from Newegg, you will get a small box just the above picture. It will have the following items as shown on the picture below. Mini CD with driver for the adapter (in case you need a driver, but you if you have Windows XP or higher you shouldn't need it as in my case). An light weight aluminium enclosure. As I figured before purchasing this USB 2.0 external enclosure for my laptop hard drive, it was very very easy and simple to setup. Many people on the Internet warned their readers to make sure the size of the enclosure is just the right size for their laptop hard drive. Generally, laptop hard drives are the same size, but sometimes you can have one that is slightly too large or small such that it won't fit into this enclosure. Your hard drive should slide into the enclosure without much effort. If it requires that you put in all your energy to put it into the enclosure, then you are going to damage it. So, just be aware of things that can go wrong. Here are the steps for setting up your External Enclosure. 1.) First, since this is a laptop hard drive you are working with, most likely it has an adapter of its own when it resided within the laptop. When removed, it exposes the hard drive pins. You must take it off before you start working with it. It looks like the picture to the right. 2.) Then, you take the USB 2.0 adapter that connects to the laptop hard drive pins. Usually, it will still be part of aluminium enclosure out of the box without being screwed to the enclosure. 3.) After that, very carefully align the holes of the USB 2.0 adapter with the laptop hard drive pins and slowly push it in all the way like the pictures to the right. 4.) Once the laptop hard drive and the USB 2.0 Adapter are married or connected each other safely and securely, you should get ready to place the hard drive and the USB 2.0 Adapter into the external enclosure. connects into your desktop or another laptop. Since this external enclosure adapter is plug and play, you can connect and disconnect your new external hard drive while your windows XP operating is running. So, you should see the red LED on the USB adapter light up if there is a power to your hard drive through your USB 2.0 connection. If your Windows XP recognise your new USB external hard drive, you should immediately see a message box running through the files in your laptop hard drive if not Windows XP message requesting for action. At which point, you can open your "my computer" to see if the USB external hard drive is listed in storage media lists. And that's how you convert your internal Laptop hard drive to an External Drive. I hope, I have provided you with enough information for you to turn your old laptop hard drive into external storage media. Being a computer expert myself, it is very interesting to watch machine with artificial intelligent competing against humans, its creator. I can say one thing for sure about machines that are used this way to show off their processing capabilities. That is that they have speed advantage. It isn't that Ken and Rutter didn't have the knowledge or didn't know the questions to most or all the answers on the 3 day special Jeopardy. Obviously, they have made millions of dollars competing against other players in the past. 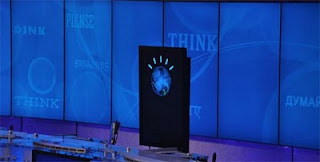 The reason Watson, the supercomputer, won the game was its processing and response speed or in other ward multitasking. Even though human brain and computer processor work in the same or similar manner in responding to a question - understanding the question, remembering the facts and retrieving the correct answer, it is the speed at which the supercomputer executes these tasks or multitasks. Ken and Rutter only began to process the question towards the end of the answer as Alex Trebek read them. However, our Watson on the other hand has already come up with an answer and responds very quickly in milliseconds. But one thing I noticed throughout the games was this. Watson seemed to always have an answer to questions that were related to places, people, things or ideas but not for questions that required human emotion or deeper understanding of the question being asked. Plus, the question needs to be worded certain way or Watson had problem there too. In fact, as they pointed out on the second day final Jeopardy that Watson answered it wrong with a lots of question marks at the end. Apparently, according to the IBM experts, Watson was looking for specific key phrases or key words to trigger his searches on. When the answers wasn't what Watson expected, it went with the best answer it got even though it was totally wrong. Computer or Supercomputer can be neat and very very fast in processing speed - a lot faster than human brain, but they lack the ability to reason and to process emotion or to relate to each and every words they process. They purely work on key words or phrases to look for answers. So, I say. Even though Watson beat humans, in the end humans are the one who created Watson. Therefore, human thinking and reasoning capacity has to be much more powerful than simple key word searching. I found an article on this neat little gadget online which I thought was interesting. It was supposedly released by Department of Homeland Security. The drone looked like and imitated dragonfly. Apparently, they have been spotted by some New Yorkers and people in Washington area. The idea that one day our lives could be filled with all kinds of electronics to keep a tap on everyone by our government is not really far out. Similar technologies exists that they can go into places totally unnoticed humans can't. Such a technologies are mainly created for military and government. It really hasn't been made available to the public as far as I know. Soon, they will be. 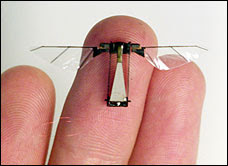 Currently, drone (Unmanned Airplane) used by military for secret surveillance by our government. Mainly used for fight against terrorism.